I'm implementing DMX on Arduino. DMX uses the RS485 standard to communicate. In the specifications of RS485 it notes that there is a positive line, a negative line and a ground line. If the positive line is at higher potential than the negative line, a 1 is given. Vice versa for a 0. Now apparently the protocol doesn't measure the difference between each line and the ground, but only the difference in potential between the positive and negative line ( which has to be at least 200 mV). This makes me assume it would be possible to easily drive DMX directly from Arduino, putting one line high (5V) and one low. 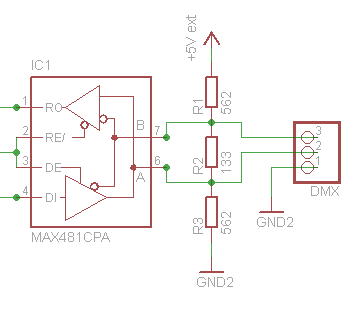 However looking at the Arduino website with some information about DMX implementations, all information I can find is using some shield over the Arduino. Is it necessary to use a shield, or will a direct connection work as well? I currently don't have any DMX components yet so I can't test it right away. A 5 volt to 5 volt DC/DC converter with galvanic decoupling. There are complete solutions in a single component available like NME0505SC or AM1S-0505SZ that can be used to generate a 5V power supply that is galvanic isolated up to 1000V. So even if there is a high voltage attached to the DMX bus there is a chance of no or low damage. High speed TTL compatible Optocouplers These chips use a LED and light sensitive transistor to isolate the DMX bus from the Arduino data pins. There are standard TTL compatible Optocouplers available like the 6N137 from MOTOROLA. but there is no isolation! Not the answer you're looking for? Browse other questions tagged arduino rs485 dmx512 or ask your own question. choosing the right Opto isolator? 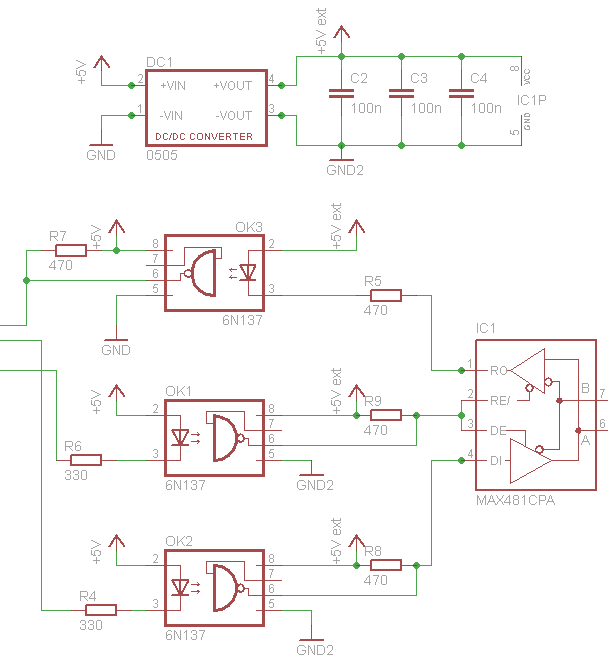 Why does FTDI RS485 signal look wrong?